Sian Gabbidon might be the talk of the town following her triumph on the latest series of The Apprentice. But the Leeds-based swimwear brand owner isn’t the only bright young thing going places in the city. A group of four software development apprentices at automotive data business cap hpi are currently also winning plaudits for their work and ideas. 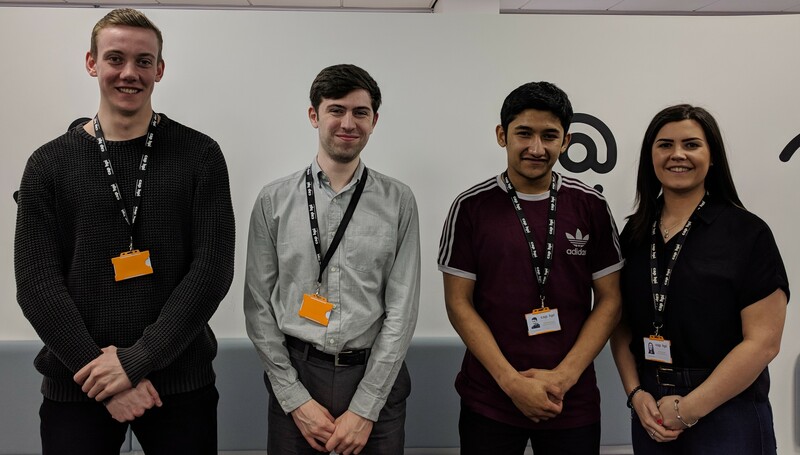 The four software development apprentices - Wesley Spellman(19) from Huddersfield, Zahid Rahman (19) from Leeds, Alex Maughan (24) of Harrogate and Holly Anusic (21) from Bingley are more than halfway through their 15-month apprenticeship at the global business. The apprenticeship scheme is the first one offered by cap hpi and is run in conjunction with Estio Training, one of the UK’s leading providers of IT apprenticeships. The four apprentices started in March of this year and upon completion in May 2019 will earn a Level 3 City & Guilds qualification as software development technicians. During their first six months in the business, the apprentices have been fully integrated, working closely with imaginatively titled development teams across the business including Danger Mice, The Code Monkeys, Snack Overflow, Trail Blazers and Bourbons. Tasks have included programming and coding, primarily looking at C#, .NET, T-SQL plus front-end HTML and Angular as well as app development and live end-user projects for clients such as the Maltese Government, which involved updating and adding new features to existing systems for hybrid car pricing in Malta. As part of the scheme, the apprentices have six weeks of off-site, classroom-based training to complete, with examinations for each module. In addition, the apprentices complete an online portfolio of work and also need to pass an interview/assessment gateway. At the end of all this, if successfully completing the Estio work alongside the work-based objectives set by Helen Wright, Senior Development Manager at cap hpi, they will be offered full-time Junior Developer roles. Commented Helen: “Our apprentices have really hit the ground running and have smashed their targets within the first six months. They’ve flourished working in a live working environment and we’re really excited to see how they continue to progress. We already have great teams of talented developers working in the business who are the ideal mentors for the apprentices and to see them integrating so seamlessly is very rewarding.